Baque kicks off with a honeyed, fruity tobacco so sweet that it borders on coconut. Projection is through the roof. People several feet away will smell you coming. After about 90 minutes, it begins to calm down with a resinous amber joining the coconut with a little bit of vanilla. 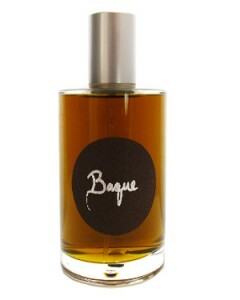 Thick and heavy, Baque warms on your skin and takes on a life of its own. A few times this has screamed for hours, while other times it has been more mellow. I think its like a fragrance mood ring the way it projects how you feel. The base notes of tobacco and wood last until you shower again. It simply doesn’t go away – it lasts a long time. Summary: Ok, I will admit it, I am a Slumberhouse fanboy. The dark, resinous interesting concoctions that they dream up could be considered the American response to Serge Lutens. Test this before you buy because the fragrance is so layered that you might get something completely than what I do. If you are a fan of Tom Ford Tobacco Vanilla (or are considering purchasing it), I would recommend trying this as well. Slumberhouse Baque is available exclusively at Indiescents. I love the Serge Lutens analogy, it’s an interesting idea. Thanks for the comment. I was exploring the two houses together and I kept feeling a rebellious spirit paralleled between the two.